Justin Sullivan/GettyOracle executive chairman and CTO Larry Ellison. Salesforce CEO Marc Benioff has seen his company’s stock soar to new heights on his promises that Salesforce is on track to hit $10 billion in revenue soon. That would make Salesforce the first cloud software company to hit the $10 billion mark. He hasn’t specified when the $10 billion moment will come but he says that this year, Salesforce is on track to do $8.3 billion in revenue. Meanwhile, Oracle just released its fiscal 2016 fourth quarter results. And in it Oracle chairman Larry Ellison, Benioff’s former boss and mentor, has some fighting words. Oracle is growing its own cloud business so fast, that Ellison thinks he could beat Salesforce to the $10 billion mark. 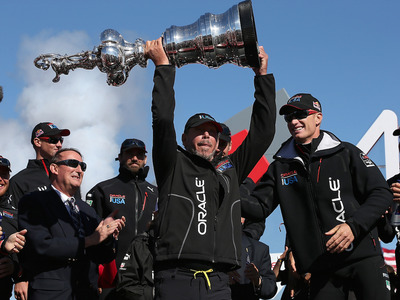 Oracle would need to keep growing its cloud business at a very fast pace to make that happen. Its total cloud revenues for its fiscal 2016 were $2.9 billion, up 36% in U.S. dollars and up 40% in constant currency. However, it is signing up new customers at a very fast pace. It said in the fourth quarter alone, it added 1,600 new customers to its software as a service (known as SaaS) and 2,000 new customers who use its cloud to write and host their own apps (known as “platform as a service” or PaaS). Meanwhile, Amazon is also on track to hit $10 billion in cloud revenue, and that looks like it could happen this year. Oracle’s cloud business is still just a fraction of the company’s overall revenues, which finished fiscal 2016 at $37 billion.